ROOM 19: The Corridor on the second floor connects the central room on the floor, The Rose, with the South-end of the Palace. The exhibits in the room date from the time of both Christian VII and Frederik VI, that is, the late part of the 18th century and the first part of the 19th. 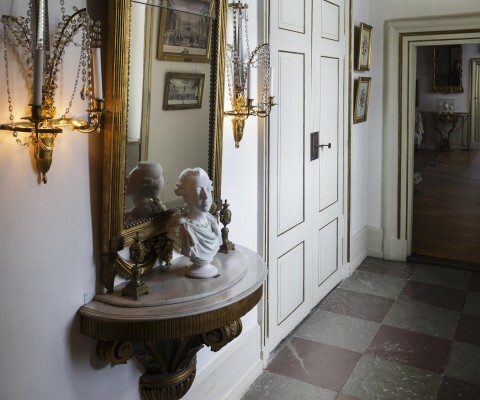 A few items are connected with Frederik V.
The Corridor contains Rococo as well as Neo-classicist styles. The styles are represented by the two sets of mirrors which are to be seen in this room. The ornamentation of the Rococo, which lies between the Baroque and Neo-classicism, is characterized by the rocaille, an ornamentation with asymmetrically winding shapes. The Rococo, which is also known as Louis XV, came from France, whereas Neo-classicism originated in Italy. 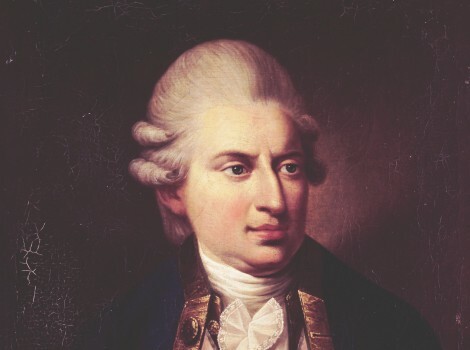 It was, however, to a great extent associated with France, and Neo-classicism from before 1790, which is dominated by straight lines and geometrical figures, is also called Louis XVI. 1901. Prince Ferdinand of Brunswick; three-quarter length oval, after Johann Georg Ziesenis. 1902. Queen Juliane Marie. Wax relief, signed: L. Spengler F.
1903. Queen Juliane Marie’s footmen at Geel’s Bakke. Painting, signed: E. Pauelsen pinxit 1774. 1904. Mirror painted in pearl grey and gilt, made for Frederiksberg Palace c. 1800, presumably drawn by J.C. Lillie? 1905. Frederik the Heir Presumptive (1753 1805), Frederik V’s son. Small plaster of Paris bust, presumably by Hartman Beeken. 1906. Console table of carved, gilded wood with white marble top. From c. 1765. Designed by N.H. Jardin? 1907. Queen Juliane Marie; copy, after C.G. Pilo. 1908. Pearl grey cupboard with gilt carving and glass-lined doors. Made for Queen Sophie Magdalene’s private cabinet at Christiansborg Palace for storing valuable artefacts. The cupboard now contains porcelain made by the Royal Copenhagen Porcelain Manufactory, except where otherwise indicated. 1909. 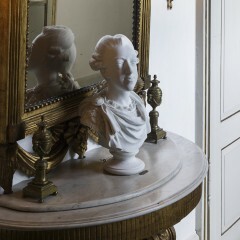 Faience bust representing Count Adam Gottlob Moltke, Lord High Steward (1710-92). Probably from the Østerbro factory in Copenhagen. 1910. A pair of potpourri vases with hunting scenes, made at the Royal Copenhagen Porcelain Manufactory in 1780 for the Dowager Queen Juliane Marie. 1911. 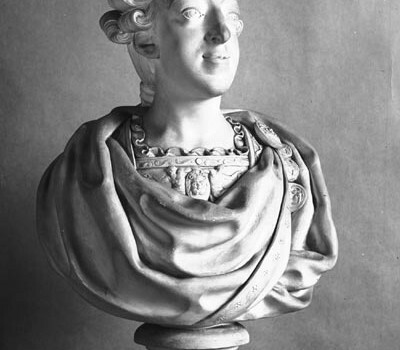 Faience bust representing King Frederik V. Made after a bust by J. Saly (from 1754), probably at the Østerbro factory in Copenhagen c. 1765. 1912. Two fruit baskets with under-dishes, dated 4 September 1780 (Dowager Queen Juliane Marie’s birthday). 1913. Slop basin, chocolate- and teacups from a breakfast service with Christian VI’s back-to-back monogram and royal coat of arms. Meissen 1730-35. 1914. Tray with three jugs and sugar sifter, decorated with e.g. harbour scenes and chinoiserie. 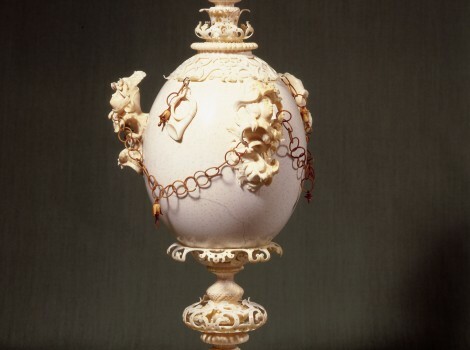 Meissen c.1730. 1915. Jug and cups from a service with Frederik V’s and Queen Louise’s monograms, coats of arms and mottoes. China 1743-51. 1916. Various specimens of the oldest Danish porcelain, pâte tendre; made in Copenhagen by l. Fournier c. 1765. * Silhouette of Landgrave Carl of Hesse, who was married to Princess Louise, daughter of Frederik V. Berlin c.1780. * Heir Presumptive Prince Ferdinand’s monogram of forget-me-nots. Made for his fifth birthday in 1797. * Friedrich and Charlotte, with crown above, probably Prince Christian Frederik and his first wife, Princess Charlotte Frederikke. Paris c.1805. * Frederik VI’s silhouette between lions. Vienna 1815. * Baluster-shaped cup with Frederik VI’s and Queen Marie’s crowned monogram, c.1823. * Portraits of Heir Presumptive Prince Ferdinand and Princess Caroline, 1820s. 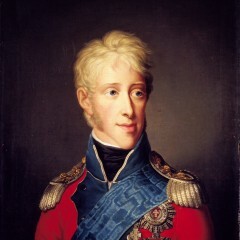 * Portrait of Frederik VII as Prince, probably painted on the occasion of his marriage to Princess Vilhelmine in 1828. By C.F. Hetsch. * Lidded cup with Frederik VII’s monogram on flowers and ivy from around 1850. 1918. Jupiter with eagle and Juno with peacock. Probably by J. Holm, c.1804. * Frederik VI’s monogram and flowers. Painted by Christian Leonhard Klein and Ludvig Foght c.1828. * View of Kronborg. Painted by Torald Brendstrup c.1829. * Frederik VI’s crowned monogram and view of Louisenlund. Painted by Lauritz Rasmus Lyngbye c.1828. This and the two plates listed above were samples which Frederik VI had made for his daughters’ dowries and for the second Christiansborg. * Hymen and a genius, 1820s. 1920. Queen Louise. Painting from the studio of C.G. Pilo. 1921. Set of mirrors consisting of gilded, carved pier glass delivered, 1785, to the Audience Chamber of Frederik, the Heir Presumptive, at Frederiksberg. Also gilded, carved console procured, 1778, for Queen Juliane Marie’s brother, Duke Carl of Brunswick Bevern, at Fredensborg Palace. 1922. Crown Prince Frederik (VI)? Biscuit bust after model by Hartmann Beeken; made at the Royal Copenhagen Porcelain Manufactory 1781. 1923. Frederik V’s equestrian statue at Amalienborg. Painting on glass from c. 1820. 1924. Frederik VI. Signed: Drawn and embroidered by Elisabeth Hansen for the 18th 28th October 1820. 1925. Two flower pieces in watercolour, signed: Louise Augusta, pinxit 1784. 1926. Frederik VI, painted by F.C. Grøger, c. 1808. 1927. 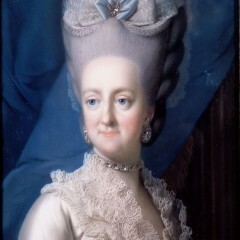 Queen Marie, painted by F.C. Grøger, 1808. 1928. 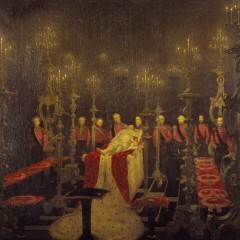 Frederik VI lying in state, painted by S.P.L. Schack. 1929. Hall at Christiansborg Palace; Crown Prince Frederik in the foreground; Indian ink drawing, signed: Fecit Wilhelm Haffner 1781. 1930. 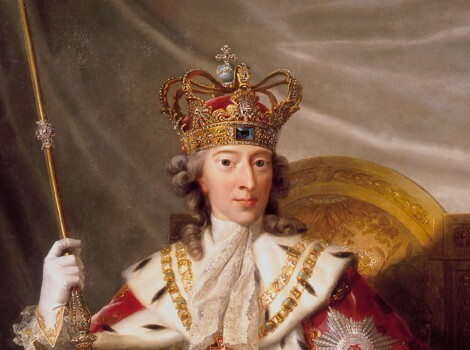 “The Audience Chamber of His Royal Highness Crown Prince Friedrich” at Christiansborg. Drawing in Indian ink by W. Haffner 1781. 1940. The six year old Crown Prince Frederik (VI) depicted as the Patron of Science with Minerva in the background. Unsigned, copy after Peder Brünniche, 1774. 1941. Christian VII; painting by unknown artist. 1942. 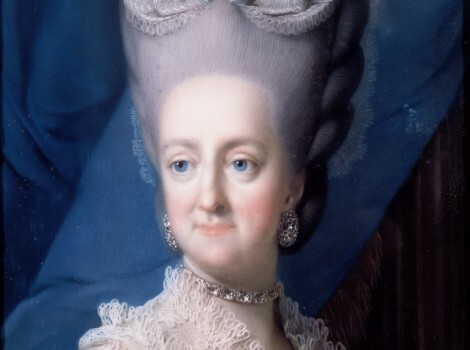 Queen Caroline Mathilde, painted by Jens Juel. 1943. 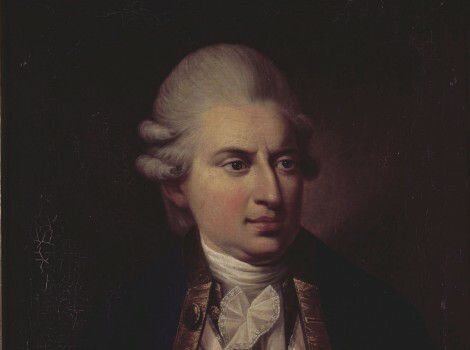 Count J.F. Struensee; copy by Hans Hansen after J. Juel. 1944. Portrait of Duke Frederik Christian (II) of Schleswig-Holstein and Sonderborg Augustenborg (1765-1814); by unknown artist. 1945. 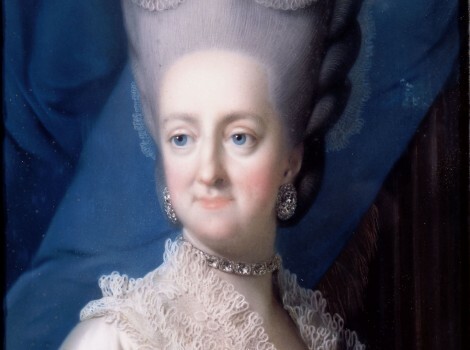 Portrait of Louise Augusta, Frederik VI’s sister, married to Duke Frederik Christian (II). By unknown artist. 1946. Juliane Marie. Pastel after Vigilius Erichsen. 1947. Frederik V. Oval pastel, painted by Cornelius Høyer? 1948. Queen Juliane Marie. Oval pastel, painted by Cornelius Høyer?? 1949. Prince Frederik, the Heir Presumptive. Oval pastel, painted by Vigilius Erichsen. J.F. Struensee was born in Germany. He was educated in Halle and worked after that as a physician in Altona. 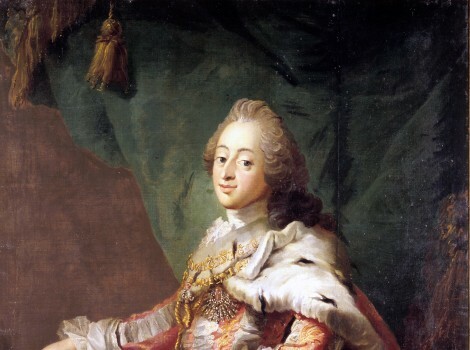 In 1768, Struensee became physician to the mentally ill Christian VII, and after having travelled with the King, he moved to Copenhagen.